Uncertainty and speed of market place changes are leading to companies to take different approaches to new product development (NPD). There is a need to reduce the time to identify, develop and commercialise new technologies to timely meet market demand. Due to the fluid market environment it’s not always possible (or strategically wanted) to invest and have all competencies and capabilities within the firm. Time and risk to market can be reduced through supply chain collaboration. Game-changing NPD activities can be stimulated through collaborators jointly exploring current (and potential) technology competencies and capabilities. 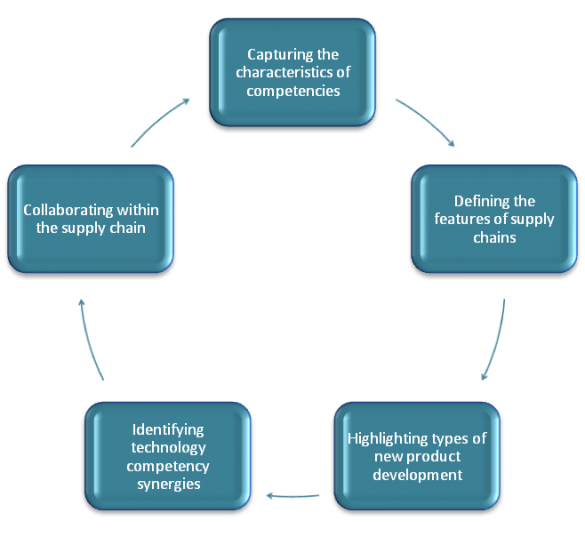 Effectiveness and sustainability of these supply chain collaborations can be influenced by aligning competencies and selecting the right partners. Literature and empirical research supports the need for a clear robust framework to support supply chain NPD collaboration. Identify firm’s internal technology competencies. Evaluate and prioritise which suppliers to collaborate with. Select different developments areas to share across a range of suppliers. The research takes an action research approach. The development of the process is based on the researcher being a facilitator as well as an observer. The researcher works for the focal company with the preliminary test cases being existing suppliers in their immediate up-stream component supply chain. The case study companies are all large multinational firms within the fast moving consumer goods (FMCG) industry. The research is based on the first two stages of Platts’ three stage process approach (Platts, 1993). Initial focus on collaborative workshops set the scene for success factors and collaborative requirements. The main implications from the preliminary test cases confirmed that there is a great need for a framework to assist NPD collaborations within technology supply chains. Whilst these initial workshops provided value to NPD collaborative efforts, they did not look at the bigger picture of aligning activities with business strategy, nor did they look at processes to sustain collaborative efforts to fully utilise competitive advantages. Selecting different developments areas across a range of suppliers. This revised approach to developing the framework will be carried out in preference to the rather narrow collaborative workshops explored within the preliminary case studies.